Sahel founded and directs the Vision Institute in Paris, which is widely recognized as the world’s leading center for basic and clinical research on vision. Sahel will sustain his engagement with the Vision Institute through a partnership formed between that Institute, the Sorbonne, the Pitt medical school, and UPMC. The major thrust of Sahel's clinical research is the development of treatments for currently untreatable retinal diseases such as retinitis pigmentosa, age-related macular degeneration, and vascular eye disease – using pharmacologic approaches, gene therapy, stem cell implantation and the artificial retina. Sahel's expertise will be a major boon for the Brain Institute's new NeuoroTech Center, which aims to restore vision to the blind. Former chair Joel S. Schuman, MD, whose pioneering work has led to significant advances in the detection and treatment of glaucoma, was appointed chair of the Department of Ophthalmology at New York University's Langone Medical Center, effective January 1. "Given that perceptive impairment from disorders of vision is a very strong risk factor for cognitive loss, dependence, depression, and trauma, Dr. Sahel’s decision to join us could not have greater importance, especially in a region of the country with an aging population," says Arthur S. Levine, MD, Senior Vice Chancellor for the Health Sciences and Dean of the School of Medicine. "José-Alain Sahel is a physician-scientist with a broad and deep intellectual reach, and I believe that his influence here, while clearly focused on our Department of Ophthalmology, will have great institutional impact." Sahel is Professor of Ophthalmology at the Université Pierre-et-Marie-Curie in Paris, the medical school of the Sorbonne. Sahel also holds the position of Cumberlege Professor of Biomedical Sciences at the Institute of Ophthalmology, University College London. He is Chairman of the Departments of Ophthalmology at the Quinze-Vingts National Eye Hospital and at the Rothschild Ophthalmology Foundation. He coordinates the Paris-based Ophthalmology Clinical Investigation Center, overseeing more than 50 clinical trials, many of them within the most advanced areas of biomedical technology, such as retinal implants and gene therapy. He heads the French National Reference Center for Retinal Dystrophies and chairs a network of more than 90 European clinical trial centers focused on retinal diseases. The Vision Institute that Sahel founded is a site for translational research on treatments for currently untreatable inherited and age-related ocular diseases. Established in 2008, the Institute now comprises 20 principal investigators and nearly 300 staff members housed in its own building. The Institute functions in synergy with the Quinze-Vingts National Eye Hospital. In landmark work, Sahel and his collaborators discovered Rod-derived Cone Viability Factor (RdCVF), a protein secreted in the normal retina that protects cone photoreceptors. This discovery provided the biological basis for paracrine interactions between rods and cones, showing that these interactions play a critical role in maintaining the viability of photoreceptor cells (Proc.Natl.Acad.Sci. USA, 1998; Nature Genetics, 2004; Cell, 2015). RdCVF has been shown to preserve central vision in several of the blinding human diseases. In addition to research on the developmental biology of the eye, functional genomics, physiology, and therapeutics, Sahel’s institute and his own laboratory conduct research on the development of high-resolution in vivo cellular imaging, relevant biomarkers, and disease models. This work has proven to be extremely attractive to industry. Sahel is a co-inventor on more than 40 patents, several of which have led to start-up companies including Fovéa Inc., which Sahel founded and which became the Ophthalmologic Division of Sanofi Aventis. He is also a scientific co-founder of GenSight Biologics Inc. and Pixium Vision Inc.
​In addition to training in ophthalmology, Sahel had a residency in neurology and neurosurgery at the Louis Pasteur University Hospital in Strasbourg, and he is certified by the French National Board in ophthalmology. Between 1986 and 1992, he was a research fellow in ophthalmology at the Massachusetts Eye and Ear Infirmary, Harvard Medical School; a visiting scholar in the Department of Cellular and Developmental Biology at Harvard; and a visiting lecturer at Harvard Medical School​. Sahel has published more than 400 peer-reviewed articles; recent papers have been published in the ophthalmology literature as well as the Journal of Neuroscience, Nature Communications, Neuroscience, Cell, Human Molecular Genetics, EMBO Journal, Journal of Biological Chemistry, Journal of Clinical Investigation, Cold Spring Harbor Perspectives in Medicine, PNAS, Nature Genetics, Journal of Cell Biology, Developmental Biology, Science Translational Medicine, The New England Journal of Medicine, and Science. Born in Algeria, Sahel studied medicine at Strasbourg University and in Lariboisière, Saint-Louis. He received his medical degree with a Medal of the Faculty of Paris and obtained his specialty certification in Ophthalmology. 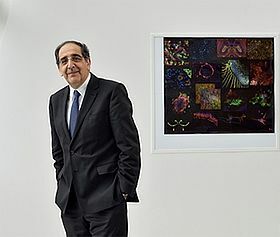 He spent his first two academic decades in the University Hospital of Strasbourg as an ophthalmologist and later moved to the Quinze-Vingts National Eye Hospital in Paris, where he became department head in 2001, at the same time he held the position of Chief of Ophthalmology at the Rothschild Foundation. In Paris, his laboratory became the core of the Vision Institute, now one of the largest centers of integrated research on eye diseases worldwide. Under his leadership, the institute conducted one of the first clinical gene therapy trials as well as becoming the French National Reference Center on Retinal Dystrophies, with the participation of more than 5,000 patients. Sahel was one of the pioneers in research on visual prostheses, allowing visually disabled patients to regain autonomy with recognition of objects or words, orientation, and mobility. Applications of the results obtained in the international multi-center trial of retinal prostheses have recently received FDA approval. His institute and the spin-off company Pixium Vision are developing, in partnership with Stanford, high-resolution prostheses. Sahel is a member of the editorial boards of 11 scientific journals,, including the Journal of Clinical Investigation and Science Translational Medicine. He has received numerous honors and awards, including the Foundation for Fighting Blindness Trustee Award; the Liura Liggett-Gund Award​; the Alcon Research Institute Alumni Award for Excellence in Vision Research; the Grand Prix for Neurosciences of the Foundation NRJ, Institut de France; the CNRS Medal of Innovation; membership in the Legion of Honour (2008); the National Order of Merit (2002); and the Jules Gonin lecture and Prize of the Retina Research Foundation. He is a member of the European Academy of Ophthalmology, the Academy of Sciences-Institut de France, and the German National Academy of Sciences, Leopoldina. He is a member or chair of many scientific advisory boards and an advisor to a number of biotechnology companies. Sahel was inducted recently in the Collège de France, the highest honor awarded to a French scientist.